When doing a cutout, we take the comb that's in the hive, especially comb with brood in it, and transfer it to the new hive. That means putting it into a frame. 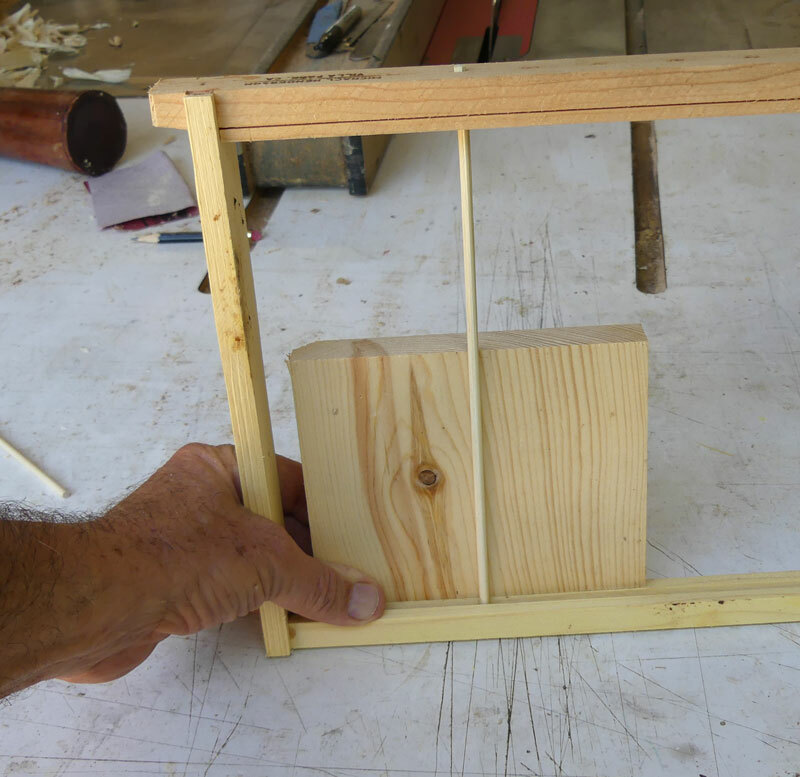 I was taught to put the brood comb into a frame and use string to hold it in place. The theory is that the bees will add to the comb and eventually attach it to the top of the frame. I don't have any comb to use in this discussion so you'll have to imagine some odd shaped comb sitting between the strings, in the frame. However, in the real world, I found a problem. The bees like having their old brood comb (and brood, of course) but they don't seem to like the string and eventually they chew through the string. I first discovered this when I saw a piece of string the bees were attempting to drag out of the hive. Anyway, when the bees chew through the string, the comb falls over against the comb in the next frame. If you leave that, you'll have a mess on your hands because you'll never be able to remove those frames individually. 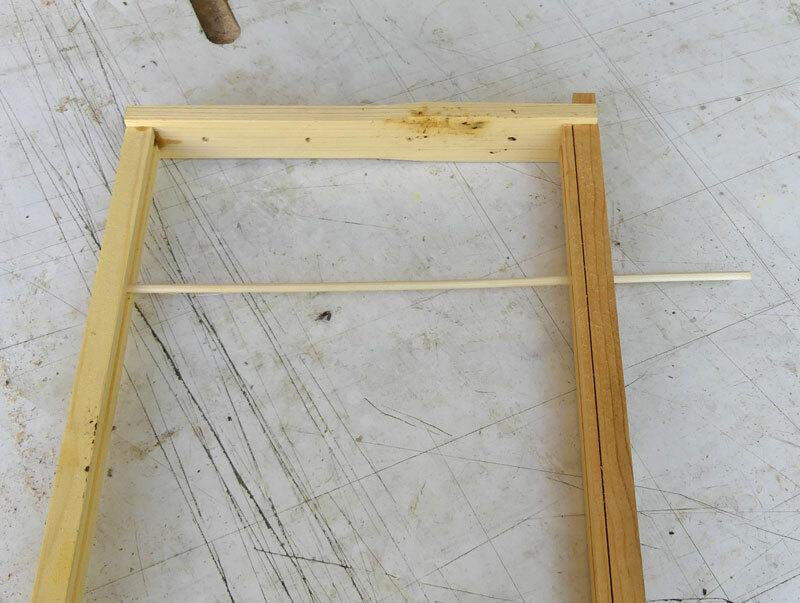 The bees will join the two pieces of comb AND they'll start making new comb from the top of the frame. I decided that I needed to find a way to hold the old brood comb in place, upright in the frame. The idea came to me to use skewers from the top of the frame to "skewer" the comb and hold it in place in the frame. When you're doing a cutout, you need to move quickly because if the brood gets cold, the brood will die. So you have to have everything in place and ready to go. I buy skewers at the grocery store. They're not very expensive. This is the label that's on a pack of 100 skewers. One problem is that skewers from different companies are different thicknesses so you need to check the size of your skewers. 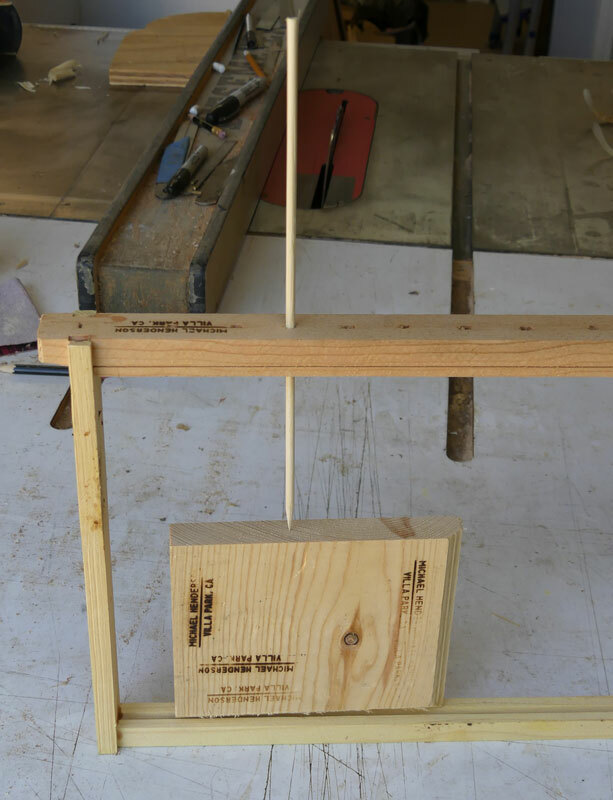 You can do this with a caliper, or you can drill different sized holes in a piece of scrap and see which size fits your skewers. You want a tight fit but not so tight you have trouble pushing the skewer through the hole. 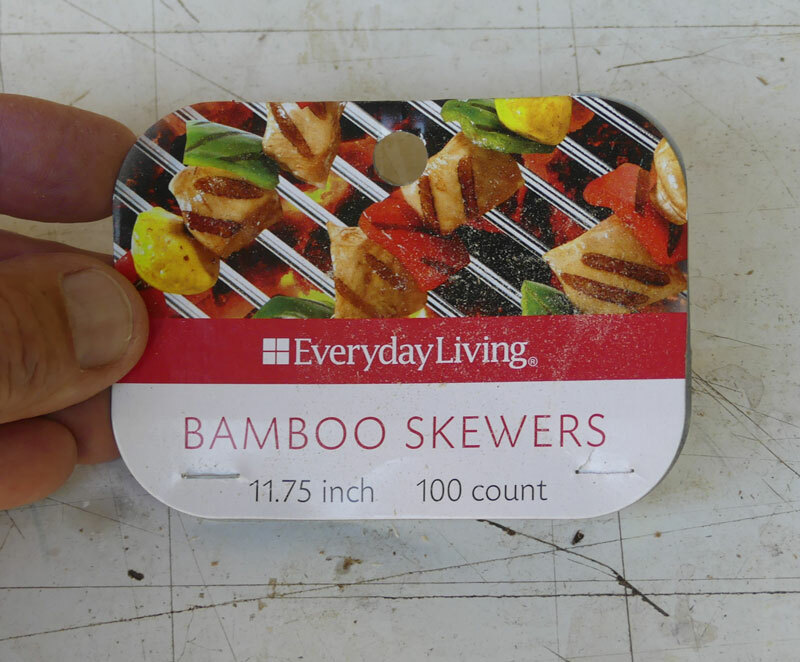 One good point is that all the skewers in a package seem to be the same size, and 100 skewers will last you a long time. 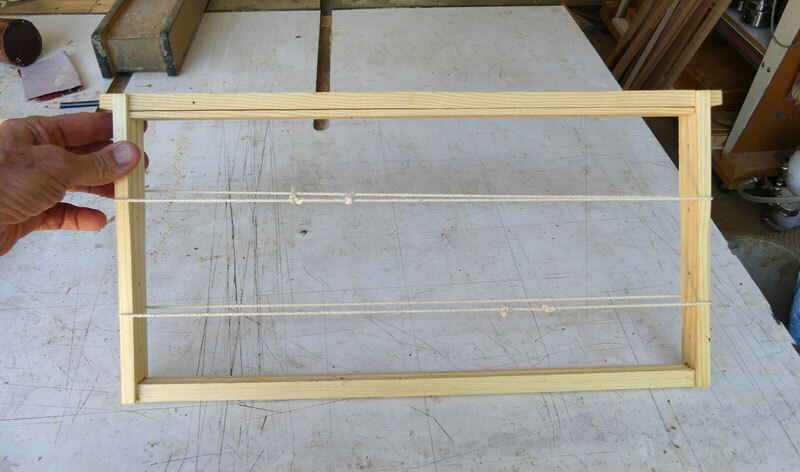 Once you find the right size hole, drill holes across the top of your frames. 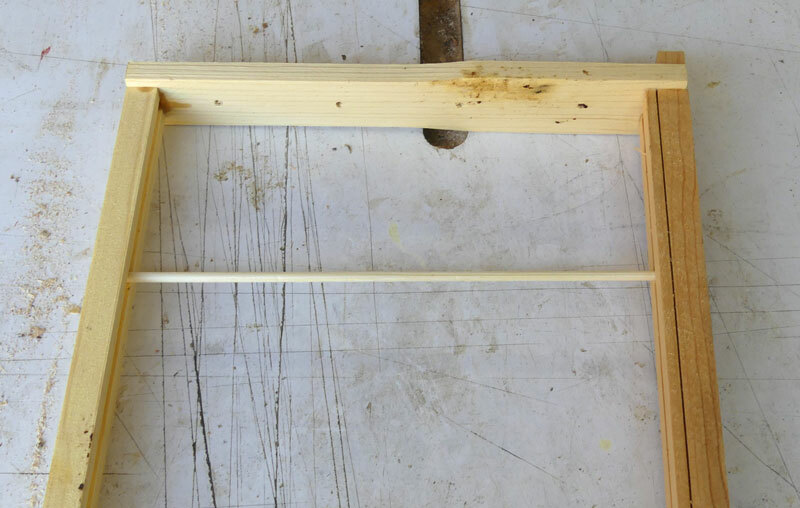 You need to drill holes across the frame because you don't know in advance where you'll need to put a skewer. And drilling the holes isn't all that difficult. I use a cordless drill and eyeball the locations. 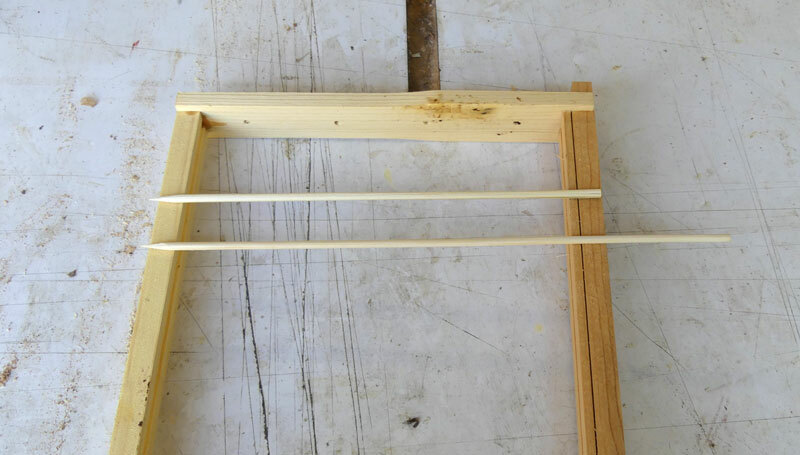 The skewers are going to be too long - they're usually about 12 inches long but a brood frame is only 9 1/8" deep so you'll need to cut the skewers. I cut one skewer to length and then take a bundle to the bandsaw and use the one I cut as a guide. Tape the bundle up with blue tape before cutting and it will make a cleaner cut. When you're working on a cutout, you want to move efficiently so cut the skewers before to leave - don't try to cut them in the field. Here's what the skewer looks like when inserted into one of the holes. I don't have any comb to use as an example, so imagine that this piece of wood is comb you took out of a cutout. You want to hold the comb upright, and in place, while you push the skewer down through the comb. The comb you're working with will likely be brood comb and you'll destroy the brood that the skewer goes through, but the bees will clean things up, and you'll have comb that will stay in place. It's nice if you can maintain the orientation of the comb - up in the old hive is up in the new hive - but it's often not possible to do that. I haven't found that to be a problem. The bees seem to work with the comb no matter how you orient it. For big cutouts, I'll often wind up with long strips of comb that's not too wide and I'll put it into the frame on it's side. The bees seem to accept it okay. Now, imagine that the skewer has gone through this piece of wood, this is what the comb and skewer would look like. 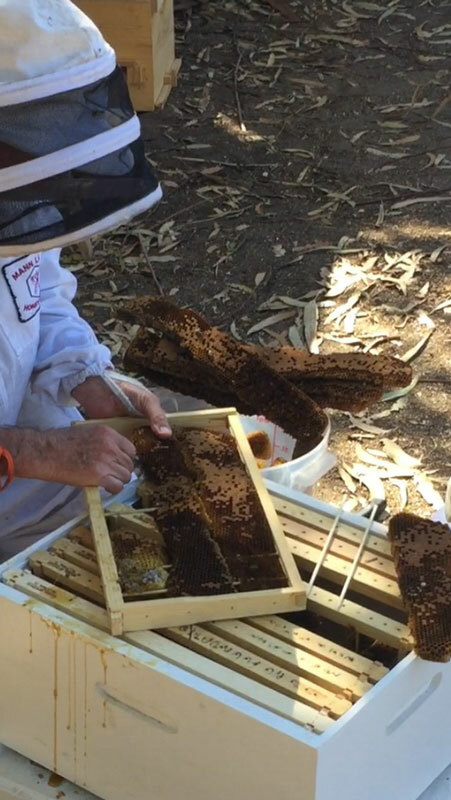 The ideal thing would be to keep track of the location of the comb as you take it out of the old hive and place it in the new hive in the same order. In most cutouts, you're just not going to be able to keep things that organized. So put the comb with brood in the center of the hive, Bees work in a "ball". Imagine a ball in the center of the hive that spans several frames. The bees will have brood in the center of that ball. Outside the brood, the bees will have a band of pollen, and outside the pollen will be honey stores. They do this because they have to keep the brood warm, 90 to 95 degrees - even when the outside temperature is a lot colder. [Update 10/8/2017] Here's a picture of me using the skewers to mount comb in a regular frame. May give you a better idea of how it works.